This Celtic wall cross is made in Ireland by Clara. 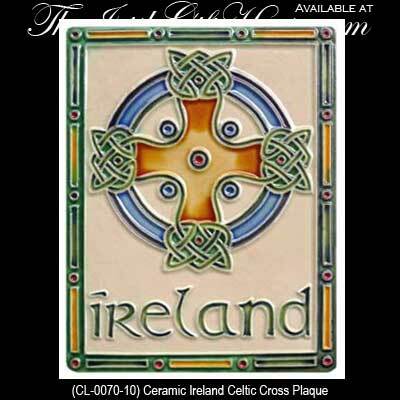 This Celtic cross wall plaque features a colorful ceramic design that measures 6" wide x 7 1/2" tall. The dimensional Celtic cross is enhanced with embossed knot-work and is ready to hang on the wall or stand on the included easel. This Irish wall plaque is gift boxed with Celtic knot and Celtic cross history cards, complements of The Irish Gift House. Majestic high crosses dot the landscape of Ireland marking ancient monastic sites or holy places. Many of these Celtic crosses are carved with interlacing knots and scenes from the scriptures.